Hot August Night III, televised Monday, December 3 at 7:30 p.m. on Rhode Island PBS, chronicles Neil Diamond’s triumphant 2012 return to the legendary Greek Theatre in Los Angeles. This special performance celebrated the 40th anniversary of his original multiplatinum-selling Hot August Night collection recorded at the very same venue in 1972. 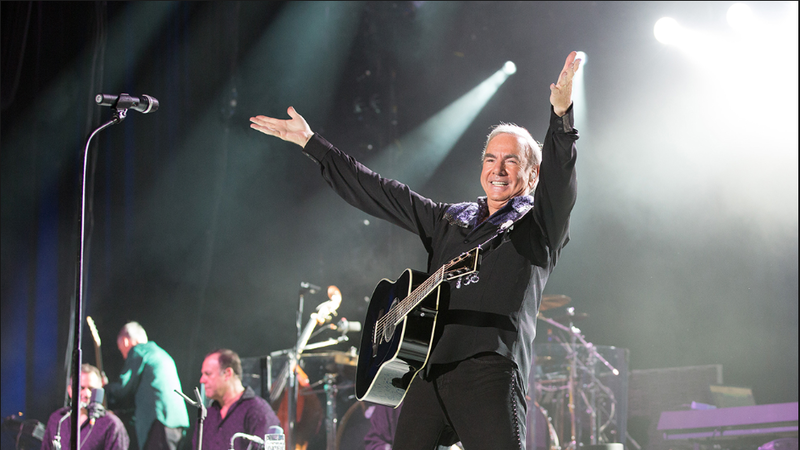 That August, Neil Diamond performed 10 sold-out concerts at the Greek Theatre. The original Hot August Night was recorded and released as a double live album. The Grammy award-winning Diamond has been touring and performing to devoted fans for more than five decades. He had his first chart hit in 1967 with “Solitary Man” and went on to sell more than 130 million albums worldwide. He has 40 gold albums, 21 platinum albums, and 11 multi-platinum albums, with 38 Top 40 singles and 15 Top 10 albums. A member of the Rock and Roll Hall of Fame, the Songwriter’s Hall of Fame, he recently received The Johnny Mercer Award and the Sammy Cahn Lifetime Achievement Award. Diamond's many other achievements include a Golden Globe Award, 13 Grammy nominations, ASCAP Film and Television Award, Billboard Icon Award, American Music Award, 2009's NARAS's MusiCares Person of the Year Award, and the Kennedy Center Honor for his lifetime of contributions to American culture. Tune-in on Monday, December 3 at 7:30 pm for Neil Diamond, Hot August Night III. Click here for information about the opportunity to receive an exclusive 64-page book, featuring many vintage color performance photos and remembrances from band members in the show. The book, music CDs, and performance DVD are available as thank you gifts for donating to Rhode Island PBS.